We make time tracking and payroll the easiest parts of your job. No more pen and paper or manual calculations. Timesheets really can be this painless. Employees clock in from any cell phone, landline, or web browser in 30 seconds or less. 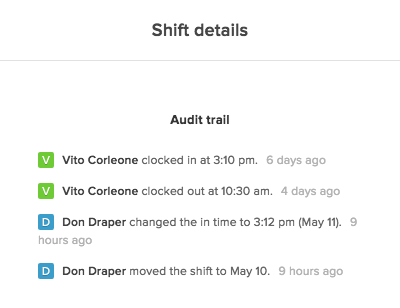 Track when employees show up, where they clocked from, and what they're working on. Generate detailed, up-to-the-minute reports in a couple of clicks. Easily export your data. Employees clock in from any phone or web browser you approve. Whether it's through a cell phone, landline, or web browser, you choose how and where employees are allowed to clock in. We track information like IP address and GPS so you know exactly where they’re clocking from. 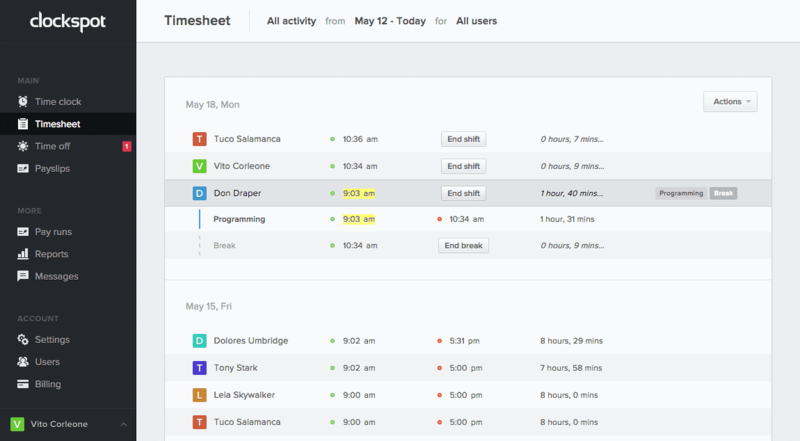 Review and approve timesheets online. See who's working in real-time. Clockspot keeps everyone honest! View a real-time feed of the tasks your employees are tackling on a simple, uncluttered interface. Employees can see their own hours, so they know their time is being calculated properly. Track jobs, tasks, projects, and clients. Want more detail? You got it! 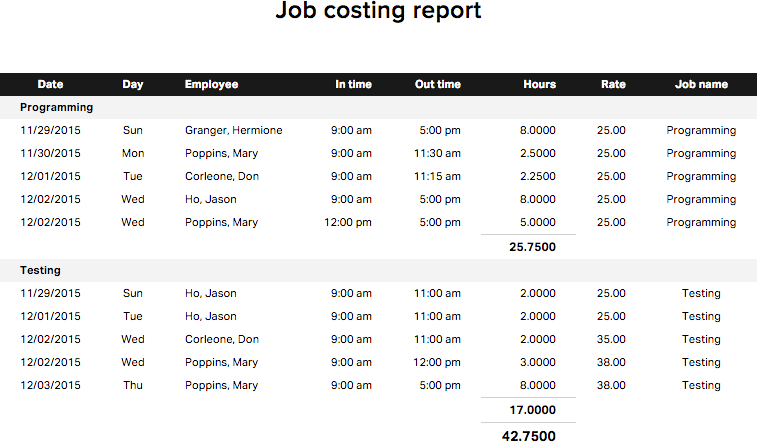 With our job codes feature, you can track exactly what employees are working on and generate a report which breaks down the job / project / client costs. Manage time off and PTO accruals. Configure your time off / PTO program, and we’ll take care of all the calculations automatically. Need different settings for individual employees? You can do that too. 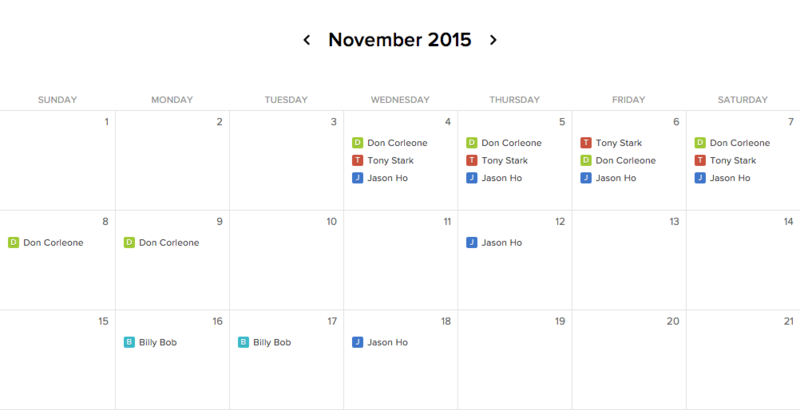 Use our time off calendar to easily see who's scheduled to work, so you can plan shifts accordingly. 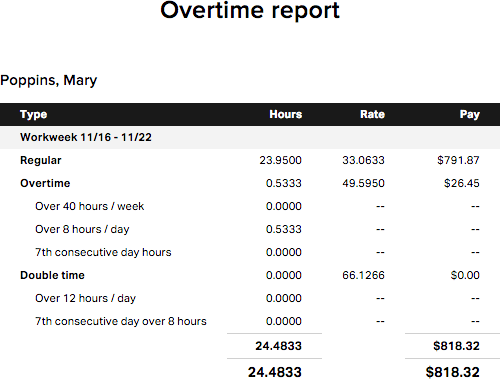 See a running tally of accrued overtime and get alerts whenever an employee is nearing their maximum so that you can schedule accordingly. 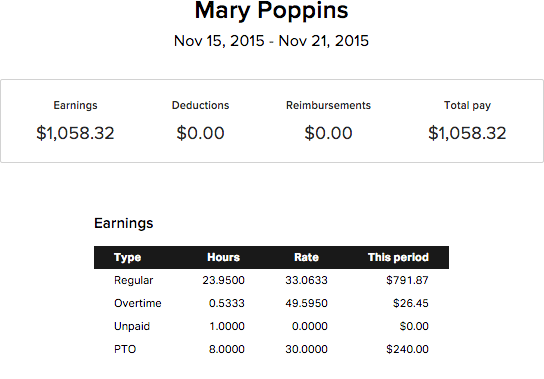 Once you’ve set up employee pay schedules, generating a payroll report takes just one click. You can see employee timesheet and time off totals for the pay period, and employees can view their payslips at any time. We track every change ever made to the timesheet, so you can always go back and see which clock times were edited, deleted, by whom, and at what time. Your data is backed up daily. Want to add another employee, account manager or owner? 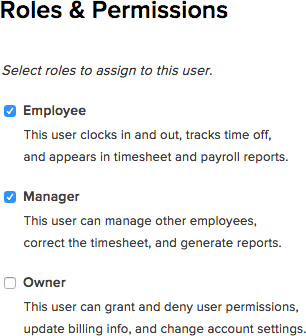 We give you fine-grained permissions so you can specify exactly what your employees can and cannot do.